Hey guys! Excluding this awesome, simple and yet satisfying recipe, I have a question for you. Have you ever gone out from your comfort zone? Are you doing anything unusual or off-limits during the week or month, that people usually don’t expect from you? Can you take a bicycle instead of car and go to work? Or can you stop eating desserts just for a week? Or may be say ‘yes’ to green tea, even if you never drink it, instead of your fav coffee? Can you stop drinking cola (I hope you don’t drink it at all)? You can serve tender scallops with strawberries or just with sauce. A glass of bubbly or chilled white wine would be perfect here! Chop and blend avocado, add cream cheese, lemon juice, salt and pepper to taste. Cut strawberries into small cubes, mix with fresh coriander. Season scallops with salt and pepper, fry in the piping hot pan 2 minutes on each side. 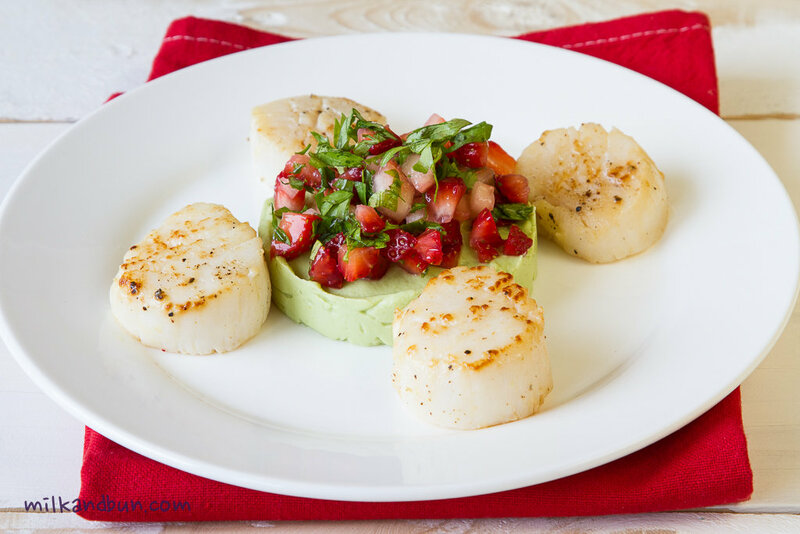 In the middle of serving plate, arrange avocado puree, top with strawberries; then arrange scallops. If you don’t like avocado, you can serve scallops simple as is with a sauce. In the same pan, where you fried scallops, add wine and deglaze the pan’s bottom. Add garlic, coriander, season to taste and bring to boil. Add butter, mix well and cook for few minutes more. Pour the sauce over the scallops. Sep23September 23, 2014 • By milkandbun • This entry was posted in Appetizer, Fish and Seafood, Healthy choice and tagged appetizer, avocado, blog, Blogging, cooking, food, food and recipes, food photography, food styling, My Life, photography, photos, recipe, romantic dinner, romantic recipe, sauce, scallops, seafood, starter, strawberry. Bookmark the permalink. I love scallops and your beautiful presentation. They cook so quickly and are so elegant. These look awesome! I have an affinity for anything with avocado, but wow, what a great combination! Avocado mouse is very tender, so it combines pretty well with strawberries:) and tastes nice! Love love love it! I love scallops, I love their taste and their texture… I bet with avocado and strawberries they have to be amazing and that my potential guests would be super excited eating this plate! I made saffron risotto with scallops…. it was very good! Or on my blog, you can find a celeriac soup with scallops and pancetta. Very good! Love the scallops and the challenge! love your challenges! Brilliant 🙂 I will say ‘no’ to giving up desserts for a week, but I could trade coffee for tea. For a week. Your recipe looks amazing–I love foods that surprise you! It looks divine!!! I am absolutely impressed!!! 🙂 Wonderful recipe!! Love your challenge to move out of our comfort zones. YES to all your questions – ride my bike – choose green tea – etc. Great reminder. Thank you. And the scallops and avocado puree with strawberries…. BEAUTIFUL.